Geneva-on-the-Lake, located on the shores of Lake Erie about an hour's drive east of Cleveland, was one of Ohio's first lakeside resorts. Today, the popular resort community boasts antique stores, a variety of restaurants, a cool water slide and a host of wineries, just to name a few attractions. The Grand River Valley, which extends from Madison to Conneaut, includes more than 20 wineries. Two of these—the Lakehouse Inn and Winery and Firehouse Winery—are located right in Geneva-on-the-Lake. Others are just a short drive away in Geneva, Madison, and Harpersfield. Nobody needs to go hungry at Geneva-on-the-Lake. The village boasts a varied assortment of eateries. Choose from Eddie's, a 1950s-style restaurant, or Mary's home cooking, or the spectacular lake views at the Lake House Inn and Winery and the Lakefront Restaurant... just to name a few. 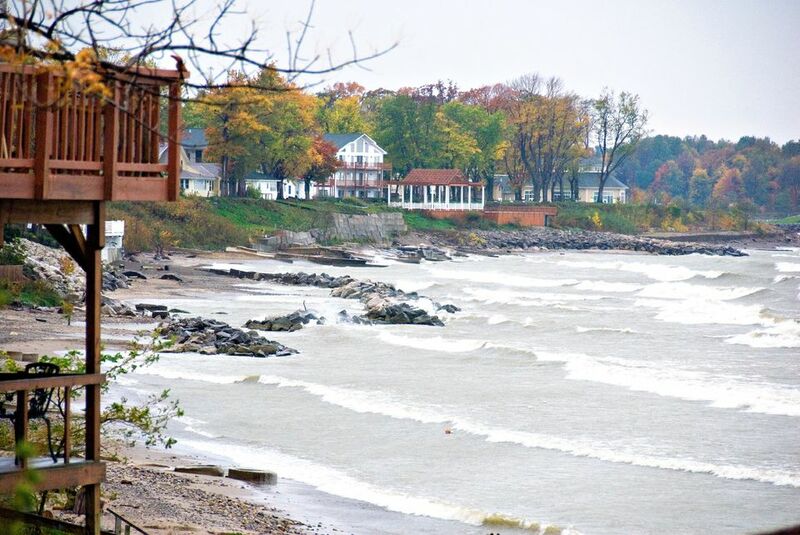 Lake Erie is an integral part of any trip to Geneva-on-the-Lake. The 300-foot sandy expanse at Geneva State Park is family-friendly and scenic. Lifeguards are on duty during the summer. Other park facilities include a marina, a lodge, hiking and biking trails, picnic tables, and camping facilities. There are also a number of small, private cove beaches all along the lake side of the "Strip." Adventure Zone, located at the curve on the west end of the "Strip," features all kinds of family fun. Open daily from Memorial Day through Labor Day, they offer Go Carts, miniature golf, bumper boats, a classic 1957-circa merry-go-round, a rock-climbing wall, batting cages, a children's play area, and more. One of the most enjoyable things to do (aside from hanging out at the beach) in Geneva-on-the-Lake is to explore the village's collection of eclectic antique stores. You'll find everything from furniture to glassware to Geneva-on-the-Lake memorabilia. Located on the west end of the "Strip," the Jennie Munger Gregory Museum, a part of the Ashtabula County Historical Society, is housed in an 1823-circa Victorian farmhouse, the oldest frame structure on the "Strip." Each room of the museum tells a different story about Ashtabula County history, including displays about Platt Spencer, the Underground Railroad in northeast Ohio, and the early history of Geneva-on-the-Lake. The museum is open year-round. Hours vary by season. Geneva-on-the-Lake is also home to the oldest mini golf course in the United States. Opened in 1924, Allison's Mini Golf is fun for the entire family. Located in the heart of the GOTL Strip, Allison's is open from Memorial Day through Labor Day.